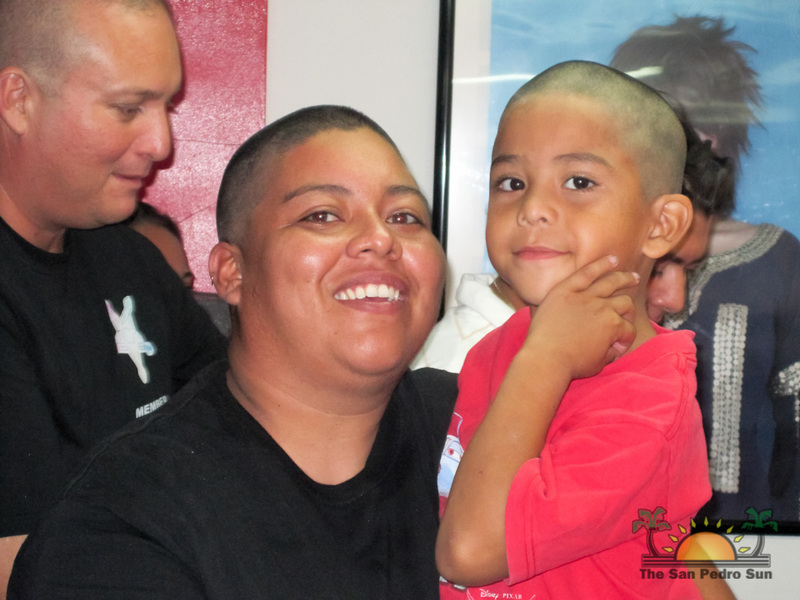 "You know, I have been thinking, while [Carlos] cuts my hair…we have a choice – we're choosing to do this…but others suffering from cancer…they don’t have a choice…now I know how my mother must be feeling…" Those words were said with a catch in the throat as Dina Graniel sat in the chair getting her hair trimmed off. Everyone watching and listening felt the importance of the moment, and more than a few tears slipped as Dina bravely held up her head with pride, as the last few strands fell off, and her new short 'do revealed her tears mixed with smiles. 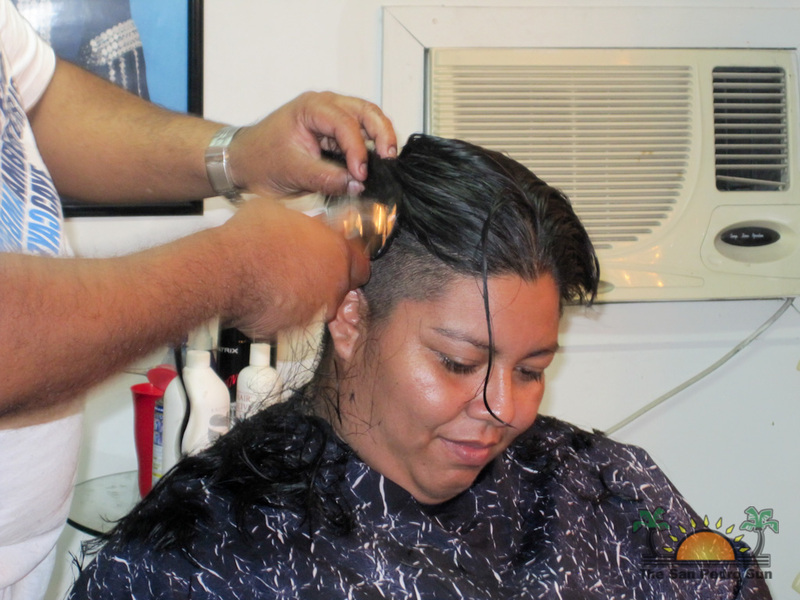 Dina was one of the three women who faced the electric razor under the hands of Carlos Barrientos, on Friday, March 23, 2012. 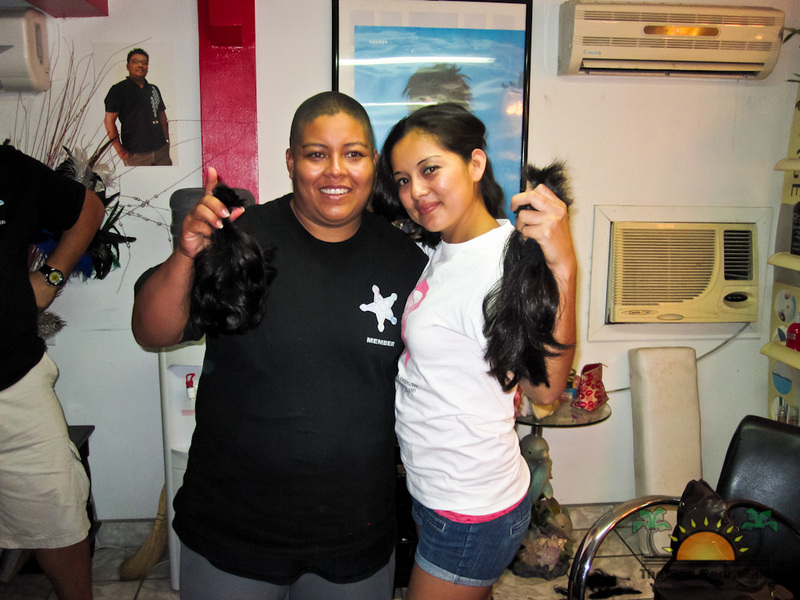 Penny Bonilla and Monica Prevett also received radical new cuts in preparation for the bigger, more public activity scheduled for March 31, 2012. 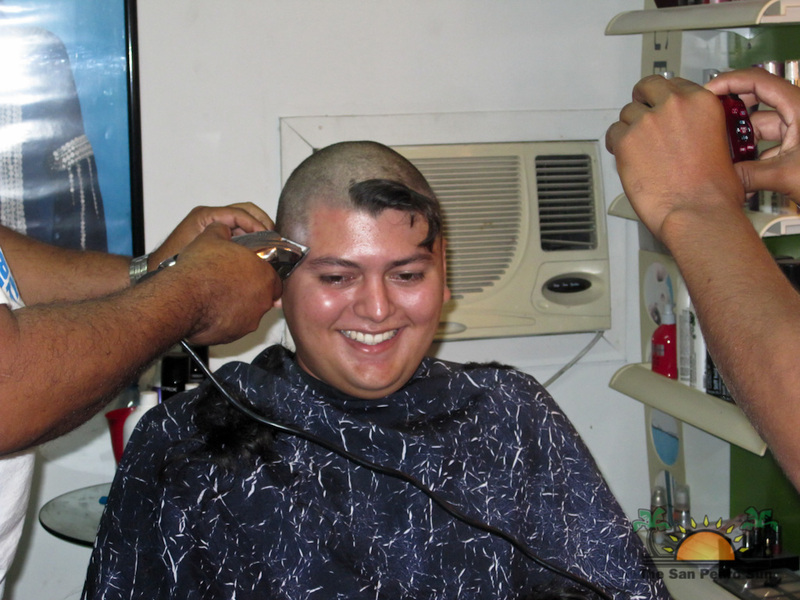 Three men also went under the shears: Enrique de Leon, Gonzalo Muñoz and Miguel Perez. Young Nathaniel joined his mother Penny with a new haircut, while Dina’s nephew Brandon sat on the chair asking to match his aunt’s look. The San Pedro Cancer Society honors those who have suffered and triumphed over, lost the battle to or continue to struggle with cancer. Cancer is a deadly disease. It knows no skin color, societal status, nor religion, gender or age. It strikes, sometimes quietly, festering for years, until it is caught and the struggle to overcome it begins. Not everyone has access to the basic information - much less treatment - for cancer and far too many people die from this awful disease. In speaking to Monica Prevett, one of the founding members of the Society, The San Pedro Sun asked as to the reason behind this particular event. Considering that a similar, just-as-radical activity had been done by University of Belize’s Communication Skills class in Belmopan (led by Silvaana Udz), some may view Friday’s exercise as a San Pedro version of the event. 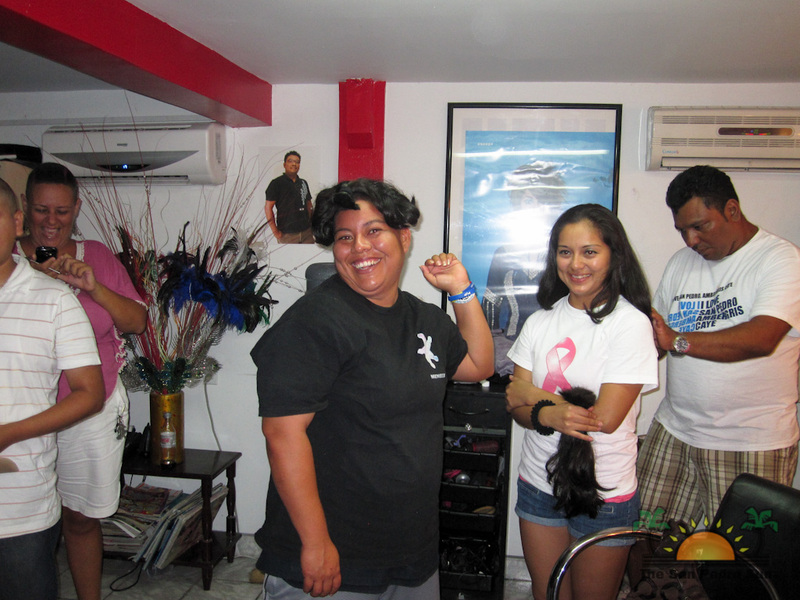 However, Prevett stated that while the San Pedro Cancer Society is in full support of the event led by the UB class, this event is meant to be a drastic one that, 1) Is in preparation for Cancer Awareness Month (April) and 2) will bring attention to the Society and the work and information they have to provide. "We are here to help," said Prevett. "We have found that despite our campaign to inform residents of San Pedro, a lot of them are being referred out of country for treatment even though we have a clinic based right here in Belize." That clinic she is referring to is the Belize Cancer Center Dangriga. 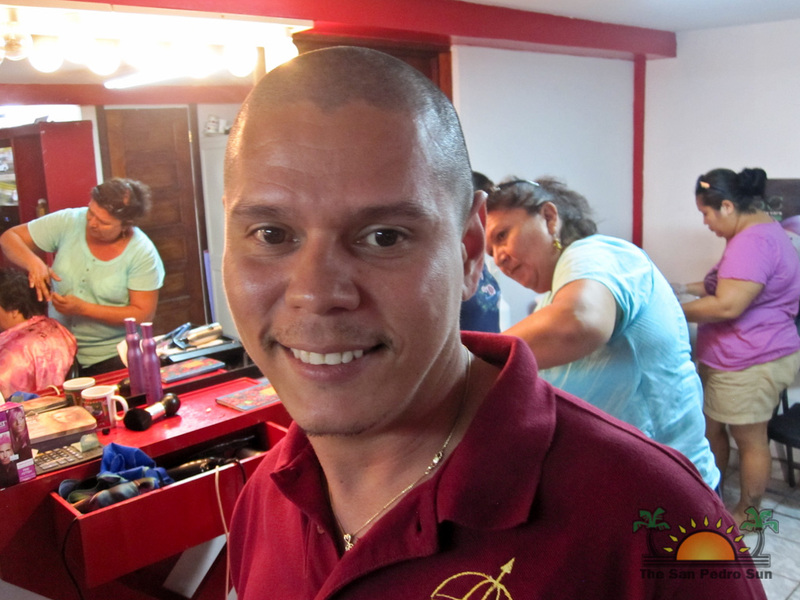 With an American-trained oncologist providing top-notch service along with American medication, there is so much that can be done locally, especially for those who cannot afford the costlier treatment outside of Belize. 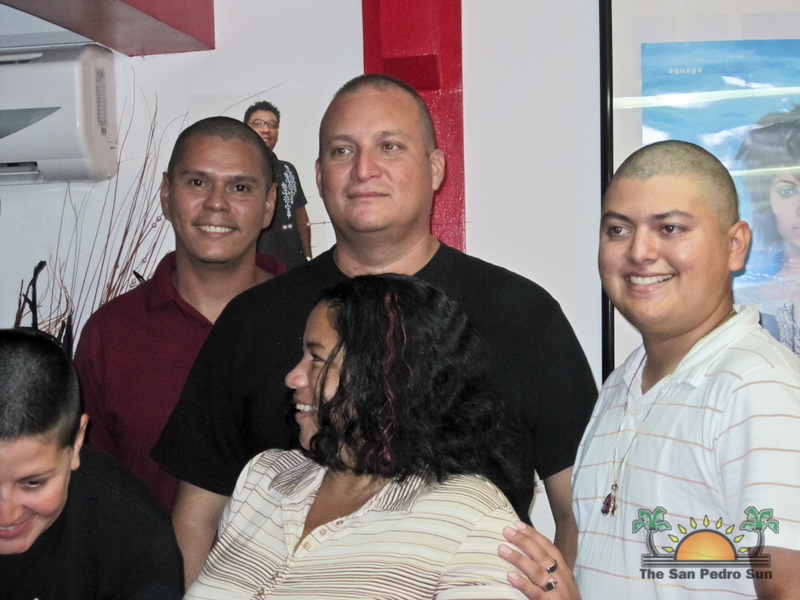 The San Pedro Cancer Society has been active for well over a year, offering support and valuable information that can give cancer victims options as to where they can receive treatment. Some people often talk about the hard choice they make in having to leave their families and children while seeking treatment far away. Far too many still have no knowledge of the help that is available, and the treatments that can help ease the long journey to health. It was with that in mind that the SP Cancer Society decided to take the drastic step to shave their heads and be noticed. Those wanting to join them in this statement while helping them raise funds can do so on Saturday, March 31, 2012 at the Central Park. For $5, you can shave your hair off completely, and for $10 those who prefer a dyed streak in their hair can get one from the various volunteer hairdressers. 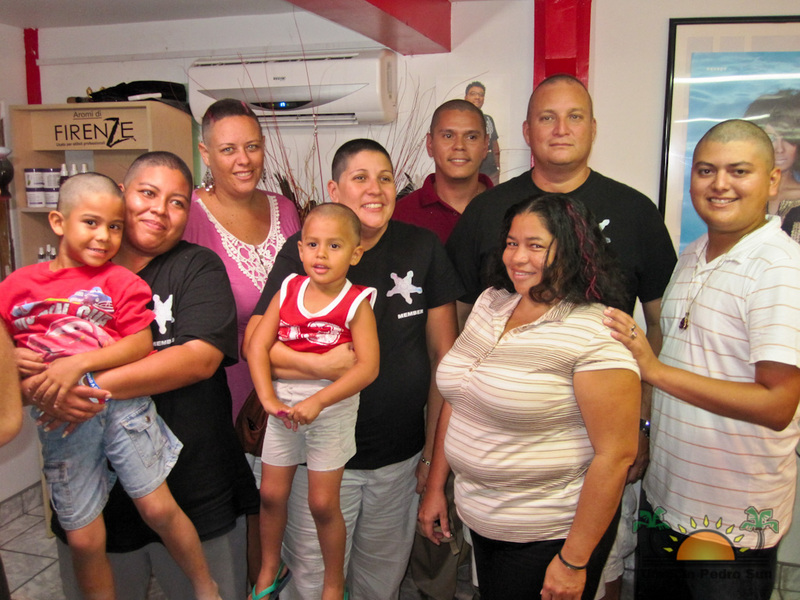 Baller’s Barber Shop, Carlos of Mar de Colores, Felix Ayuso of JoSe’s have signed on to the project; if you wish to shave your head, you can also get sponsors to "dare" you to do so, and all proceeds go towards the San Pedro Cancer Society. Kudos to the brave women and men who have taken this drastic step to bring more awareness, and see you at the park on Saturday!